I can see lights, lanterns, glam and glitters, yes holiday season is here. How about your holiday wardrobe. Are you ready? While in summer we don't like cakey makeup, in holiday nothing hurts to add a bit of glam or glitters to your regular outfit. Earring - A great pair of earrings... I love large or statement earring. A pair of earrings definitely elevates your basic look to glamorous one. As a busy mom, I prefer instant fixes. I love to wear statement earrings. And here your basic look get an instant chic makeover. Necklace - Just like earring, I like statement necklaces. To dress your basic sweater or blouse add a statement necklace. Lipstick - A red lipstick or bright lipstick... 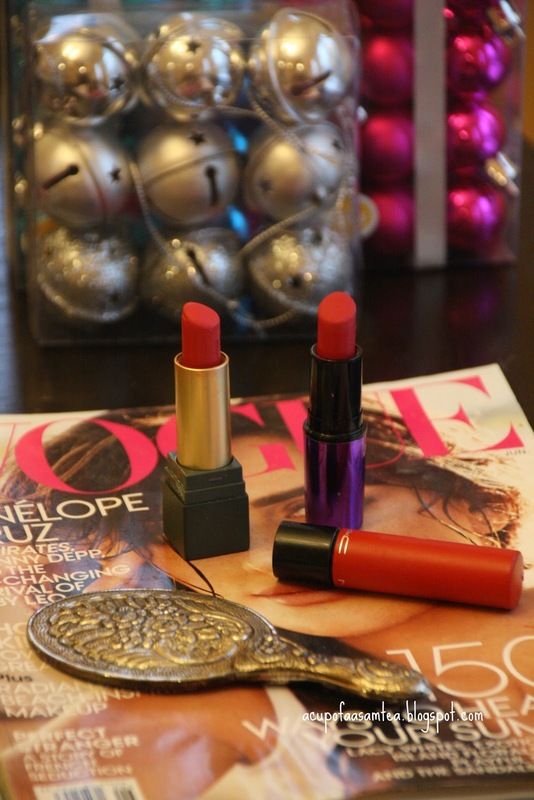 I can't think of the holiday season without red lipstick. Obviously, depending on your preference deep maroon or crimson red. A red or bright lipstick can make up or break up your looks. A right bright or red lip. Sequins- A bit of sequin whether it is a blouse or skirt is a must-have for holidays. For glammed up holidays, nothing can add as much glamor as the sequence can. Shoes - Last but not least a pair of metallic shoes. Just to get a perfect look. A right finishing touch for your holiday look. The list must go on, the basic black dress to bounce in brocade pants, furry in fur. But time to wrap up and get set for the holiday season. love all the sparkles! You look very glamorous! Thanks for the wardrobe tips! will show it to my girlfriend. I think she will like it :). Thank you much! Oh yay! Sequins is must have! I love your jewelry selection. Those are really pretty! the main update in my wardrobe is jewelry as in chunky earrings! i got a few and i am loving them! I got great love for neclaces...I love them chunky and I'm never tired of stocking more and more, with color silver and golden being my must haves. Loving the whole look, great jewellery. I love beautiful holiday looks! So festive, merry, and bright!! I like the lipstick and necklace you choose! Good tips. A red lip always says holidays to me. Refreshing to see a fashion post! you look so stunning! 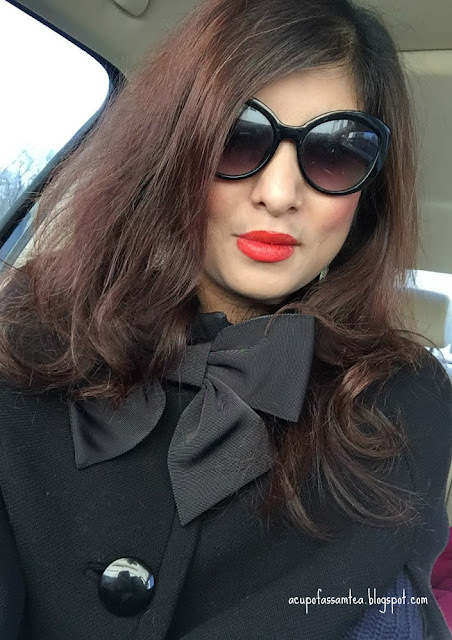 love the bow, your sunglasses and red lipstick. I am totally into the statement earing trend, bought few pairs this year. This is a great list! I love statement earrings and necklaces; they add a festive touch to any outfit! I am going to take a gamble and embrace sequins this holiday! I've seen sequined leggings and miniskirts everywhere-even Old Navy! Now I know I need to go out and get some sequence pieces of clothing!! I have been wanting something festive for the holidays! Wow those earrings are fabulous! Will you also wear them this New Year's Eve party?! Love the earrings and necklace!! Great wardrobe! Good Tips! And I agree, nice earrings and necklace can totally change your look! It will be great with the wardrobe and you'll get ready for the holidays. Have a good time..!! Pearl Earrings look great! Have a good time! Lipstick and earrings can make a huge difference to an outfit. My holiday wardrobe needs all the updates that it can get. I think that I probably do not even have anything that classifies as a holiday outfit. Haha! I do like the tips that you give to easily spruce up an outfit that one may already have. I am loving your vintage vibe with your accessories and even your lip color! I do not like caked on make up either so accessories and doing makeup right, with a statement lip is the best way to go glam during the holidays! Loving that lipstick. It is bold and great for the holiday season. I love getting dressed up this time of the year. And sequence is a MUST!! Great updates. I love your lipstick! I could never pull that off. Perfect for the holidays! Great tips! I love anything with sequins during the holiday season and of course having the right necklace and lipstick really helps when it comes to added that extra pizazz to your outfit! You can't go wrong with a great pair of statement earrings and a bold lip shade! I love these! 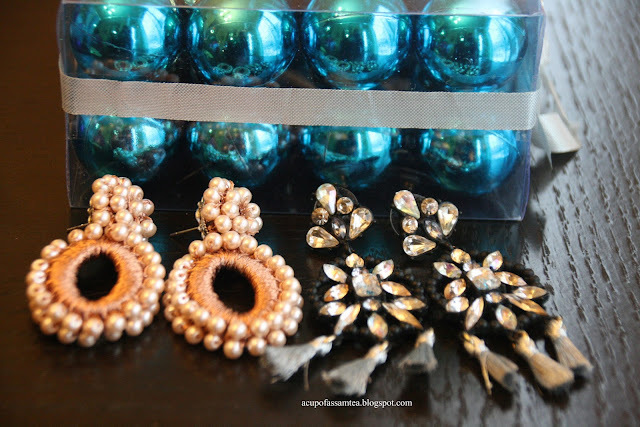 Those earrings are really pretty - perfect for a holiday party and to wear all season long! Love this look, very elegant and fun at the same time! you are beautiful! Great ideas and additions for party outfits! Details make the difference, and the right accessory can completely change every look! 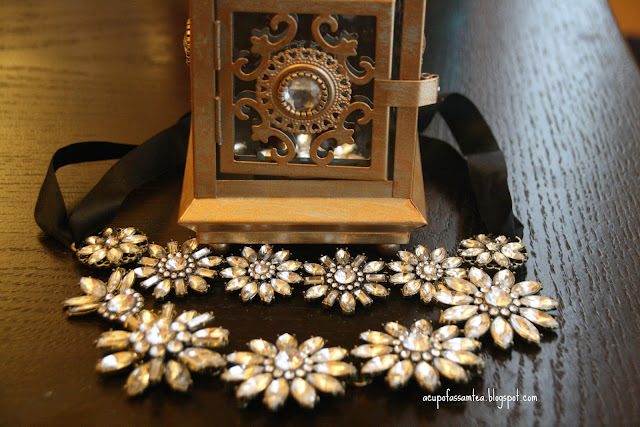 Love all the sparkly ideas you can have as accessories. They are perfect for the holiday season! Ah! You're so right about sequins. I used to think it was just for grandmas but now I know how much better it really does make things look, especially during the holidays!